From front of house to back of house, our sauce goes the distance. Leverage our world-famous flavor in your next product. Sign up for the latest product news, industry insights and TABASCO® Brand updates. You will be receiving a confirmation email from TABASCO® Sauce shortly. 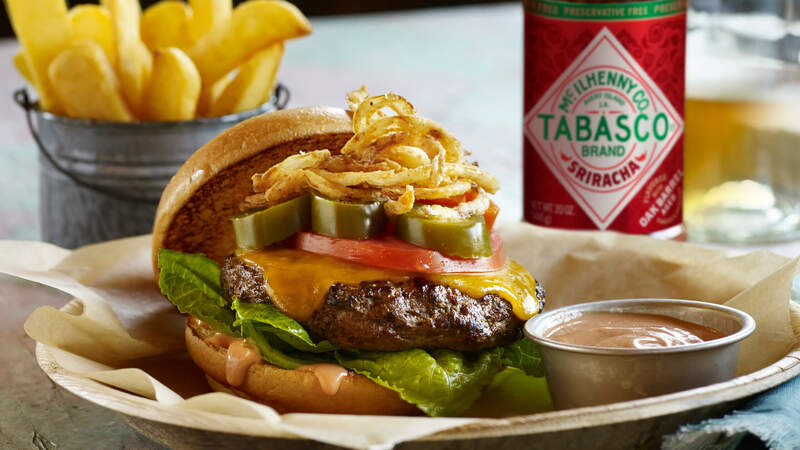 For an explosion of flavor, try this El Diablo Burger recipe with horseradish cheddar cheese, crispy fried onions and a Sriracha-based sauce. TABASCO® brand Sriracha Sauce --- 2 Tbsp. Horseradish cheddar cheese slices --- 4 ea. Brioche buns --- 4 ea. Romaine lettuce leaves --- 8 ea. Mix together TABASCO® Sriracha Sauce and mayonnaise to make an aioli; set aside. Form four 8-oz. patties from the ground beef; grill to desired temperature, then melt cheese atop burgers. In an oven, toast broche buns until lightly browned. Spread aioli on both sides of buns. Place two leaves lettuce on each bottom bun, then layer a burger over the top of each. Top each burger with 2 slices tomatoes and equal amounts of jalapeños and crispy onions. TABASCO and the DIAMOND and BOTTLE LOGOS are trademarks of McIlhenny Company, Avery Island, Louisiana, USA 70513. © 2019. TABASCO® Brand. All rights reserved. We want to stay in touch! We'll send you the occasional update, but only the important stuff. Your Kitchen Just Got Spicier! Thanks for sharing! Let us know what you think by rating this recipe and be sure to check back for new ones! How Much Did You Like This Recipe? Drag the slider to the desired rating, it’s that easy. So many foods. So much flavor. Keep browsing to learn more about how TABASCO® Sauce will enhance your favorite recipes!